If you were born into this numbers vibration, you’re on a personal journey to build the foundations we all need to root into this life. Your highest path will encourage you to be practical and apply the wisdom of your ancestors in a rapidly changing world. In Numerology, the Number 4 represents stability, dependability and practical creation. It brings the 4 corners or any structure and the 4 elements – earth, air, fire, and water – which make up the foundations of our material world. As a person, this is the energy you bring to the world! And it’s what the world most needs from you, so it’s important that you embrace your Numerology. You’re reliable and trustworthy, loyal and tenacious. If a job needs doing, you’re the one with the discipline needed to give it the hard work it needs, to the very end. And your standards never drop. Even when times are trying, the attention to detail you hold is supreme! As someone who always takes pride in your work, you’re not likely to take shortcuts, and will never do anything you sense is remotely dishonorable. Because of your reliability (not to mention the profound knowledge you amas within your field of choice), you’re one of life’s born teachers. Your skills are likely to be practical, occupational and rooted in the real, material world of knuts and bolts living. So when people need instruction, you’re hands-on and exceedingly thorough. You’re honest in relationships, preferring to live an open life, wherever possible. That’s not to say you’re ruled by your emotions – you’re in tune with how you feel but you certainly won’t let that get in the way of what needs to be done. Because of the rooted nature of this number, it’s likely you’ll be called to work with the stories of your ancestors and possibly even enter into Karmic relationships within your lifetime. This is vital work and creates the foundations from which humanity will be able to evolve. With a very fixed sense of what’s right and wrong, this number gives you opinions and you’re certainly rigid in what you believe! This means that other people know exactly where they stand with you, and you’re a reliable team player. Happy and eager to give advice, others willingly take it and they tend to trust you. And being trusted means the world to you. Number 4, very much like the horoscope sign Taurus, your very fixed nature can make you stubborn at times, and despite the energy of momentum you carry, you lack spontaneity. This means that you’re far more likely to stick to what you know and love than take a risk and strike out of that comfort zone. Which is a shame, Life Path 4! And it’s likely you’ll miss out on some big opportunities in life, through your deep-seated mistrust of the unknown. You risk developing a martyr-like attitude, often believing that you are the only one capable of performing certain tasks to your high and exacting standards. Others may get so used to you rebuking their offers of help, that they simply stop showing up, thus reinforcing your fixed, Trojan attitude. It would serve this Life Path Number well, to learn the arts of delegation and humility. Sure, you probably can do it all better than anyone else, but that’s not always the point, right!? You may also need to watch your communications methods as some of these Life Path Numbers are notorious for tactless, unsolicited advice giving. You DO know so much and you DO have strong opinions, but these can verge on the narrow-minded. So you must learn to share when it’s appropriate, and with enough understanding and compassion for others. You care deeply for the wellbeing of your family and community and believe it’s your duty to provide for them, every single day. So you do. The safe haven you create serves as an incredible seedbed for the significant people in your life to thrive, and this is important and brings genuine meaning into your life. So you’ll attract people who need this, and appreciate you for it. This Life Path Number will probably have the best long-term compatibility with someone who’s willing and able to inject a little fun and passion into the relationship. 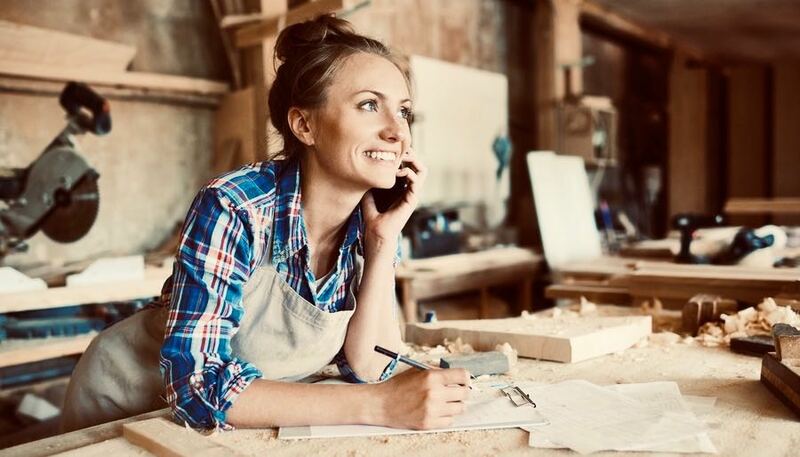 That’s not to say that you can’t – well, perhaps not as much as you may need – but without that spark, any committed partnership you enter into could risk becoming routine and pretty dull, pretty quickly. Who do you share the Number 4 with? Woody Allen, Russel Crowe, Quentin Tarantino and Oprah are just a few of the rich and famous that you share this grounded, practical and tenacious Life Path with! 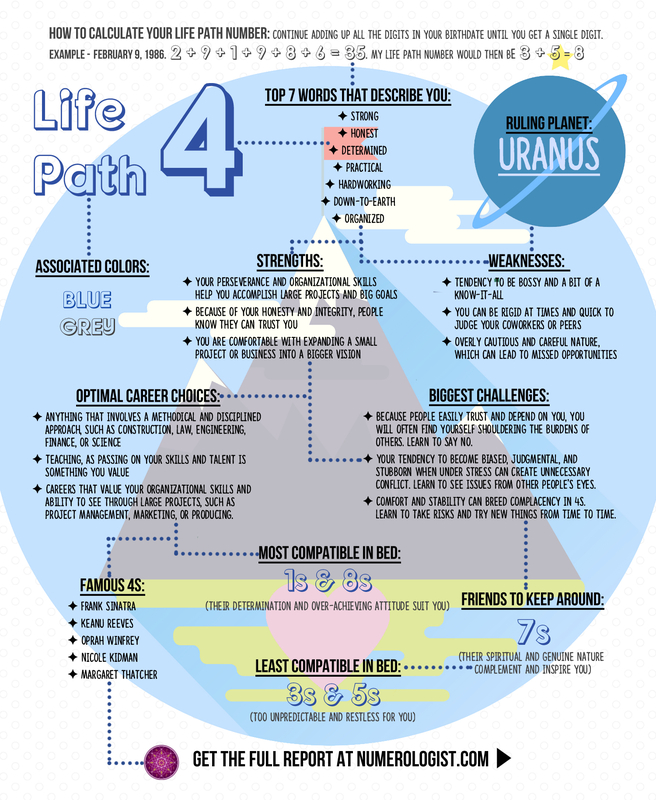 Free Life Path Number 4 Infographic! Just pop in your birth name and birthday and your customized report will be ready!